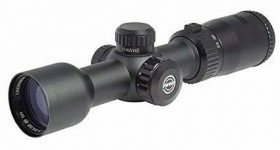 If you need a scope that can keep up with your fast crossbow, then this high performance model from Hawke might be just what you are looking for. It has the ability to keep up with bows firing at speeds from 275 feet per second up to an impressive 425 fps. This is fast enough for you to sight and fire on agile deer, along with other quick moving game animals. The one issue that some consumers have with this powerful scope is that the speed and magnification are both adjusted at the same time. This means that whatever setting for speed you select will automatically come with a specific magnification. While this rarely causes any problems out in the field, there might be times when you need a higher magnification but don’t want to change the setting for speed. One of the reasons this scope is a favorite with bowhunters is its versatile and durable design. It is designed to withstand harsh conditions outside, and can even survive the occasional fall. It is also weather resistant so you can easily see targets even when it is raining. What really sets this crossbow scope apart from other models is its versatile design. Since it comes with an innovative speed selector you can easily use the scope with any crossbow, even those that are capable of firing arrows up to 425 feet per second. With the ability to use this powerful scope with your fastest crossbow you will be able to hit almost any moving target. Adding to its versatility are the illuminated markers on the reticle. 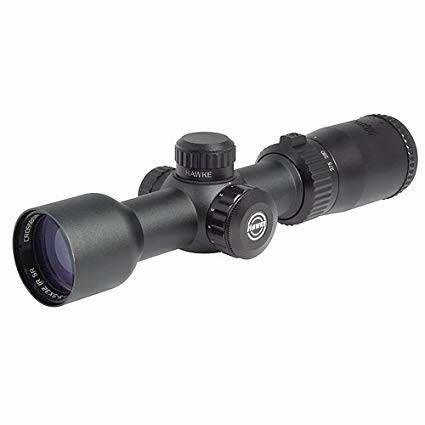 With the ability to clearly see the distance markers in low light, you can easily use this scope for hunting at night. While it is legal to hunt some nuisance game at night like feral hogs it is best to make sure that there are not restrictions in place in your area. Some consumers might question the slightly higher price of this crossbow scope, but this is only until they use it. Often considered one of the top rated products on the market, serious hunters will find that it is well worth the extra cost when they bag their first buck or bull of the season. The powerful one inch optics are red and green colored for crisp and clear images, and fully multi-coated to ensure plenty of the surrounding light is allowed through. This will help make details “pop” so you know exactly where to aim for a humane killing shot. With a 1.5- 5 x 32 magnification and the ability to match the speed setting on the scope to your crossbow, there will be very little that will get away from you with the SR from Hawke. The SR scope from Hawke is designed to be easy and convenient to use, just like the MAP. The speed settings are easy to adjust without the use of tools, and the magnification will automatically change to match the new preferences. The SR also comes with illuminated markers on the reticle so you can easily line up a shot in the dark. With points starting at 10 yards and increasing up to 100 yards it is easy to find the perfect place to aim to ensure you consistently hit the target. Even though the SR from Hawke is priced slightly higher than some similar models, it is well worth the added expense when you bring home your first large buck. The powerful optics will ensure you can clearly see you targets up to 100 yards, and with the ability to match crossbows with arrow speeds up to 425 feet per second you might never miss a shot again. You will also appreciate how easy this scope is to mount so you can quickly get out the door and see if the SR from Hawke will really improve your proficiency with a bow.